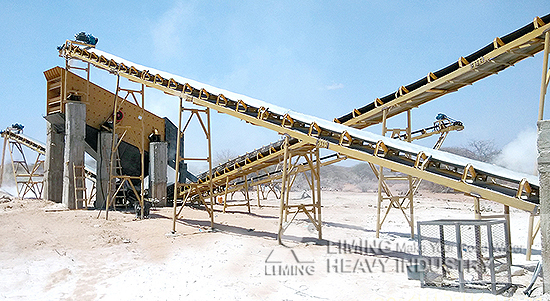 Belt conveyor made in Liming Heavy Industry is ideal conveying equipment for colliery, which takes advantages of long conveying distance, big traffic volumes and continuous conveying. It is easy to realize automation and centralized control. Belt conveyor is key equipment of mechanotronics especially for High Output and High Efficiency Mine. The body of belt conveyor with storage bin can stretch out and draw back freely, and tail can extend or shrink when coal face pushes. It is unnecessary to install base and you just need to lay conveyor on the roadway floor. The body of conveyor is light and easy to disassemble. When conveying capacity and distance is large, it can be also equipped driving device to satisfy the requirements. According to conveying process, you can choose one machine, multi machine combination or declining transportation system to convey materials. Besides coal mine, belt conveyor made in Liming Heavy Industry can be used in metallurgy, traffic, hydropower, construction, etc. industries. If you are interested in belt conveyor, just contact us by email info@limingco.com or phone 0086-371-86162511.